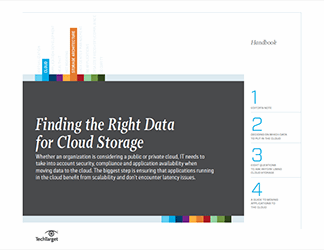 In this handbook on finding the right data for cloud storage, industry experts Marc Staimer and Arun Taneja share their best practices and experiences with cloud installations and moving data to the cloud. They’ll outline how to evaluate your organization’s security plans, recovery times, accessibility needs and cost requirements to determine where and when to apply cloud technology. In addition, they’ll answer such key questions as: What about primary data and the cloud? Will I need to rely on object storage? and Can a public cloud meet my availability requirements? Whether you’re just beginning your search for a cloud storage provider, considering a hybrid cloud project or building your own private cloud, this handbook can serve as a guide to your project and help you design a roadmap for moving data of all types to the cloud. In-memory analytics tools and big data: A potent mix?